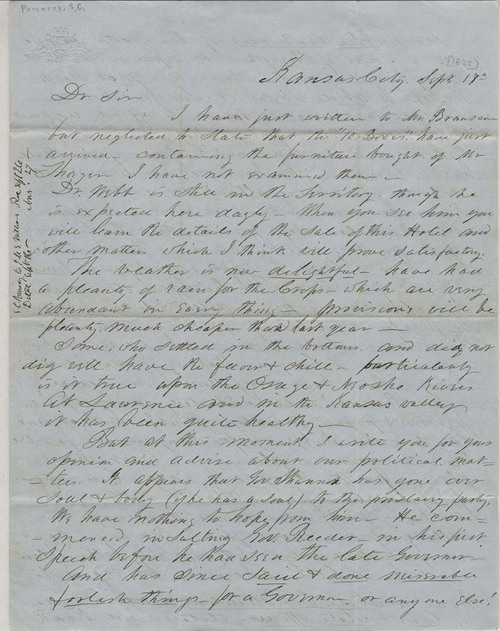 Samuel Pomeroy, writing from Kansas City, Missouri to J.M.S. Williams, an officer in the New England Emigrant Aid Company, described free state political strategies. Specifically, Pomeroy mentioned free state plans to hold their own election for a delegate to Congress, to call for a constitutional convention, and to push for the admission of Kansas as a free state.